The next big step is setting up your sewing room. A properly setup sewing room can be the difference between smooth sailing and major headaches down the road. In this post, we’ll go through the ENTIRE step-by-step process of setting up your sewing room the RIGHT WAY. In the average home, you may have the option of choosing between 2-3 rooms to setup your machine. If you only have one room, then just use that. When picking your sewing room, it’s less about finding great qualities, and more about AVOIDING the bad ones. Sewing is about precision and control. If you CANNOT see what you are doing, then you CANNOT sew. Poorly lit rooms are going to be the cause of many headaches. Lots of natural light is not only going to help you see what you’re doing, but it will also help you relax while sewing. Did you know that being relaxed while sewing has been proven to result in 35% fewer mistakes? This is why I recommend you find a room with great natural lighting. If you don’t have one available, then bright room lights will work too. I do recommend that you put some plants and pictures in there to help you relax. It’s nearly impossible to have great precision and control when you’re constantly being distracted. Your sewing room needs to be nice and quiet. Spend a bit of time in each room you’re considering. You’ll quickly see which rooms are loud and which is quiet. Remember – you will be a source of noise for everyone else in your home. Put some light music on in the room and stand outside of it. If people can hear you, then you’re going to want to grab some plants and/or wall art to reduce noise from leaking out of the room. Pick the quietest room for your craft studio. Rule of thumb: the bigger the room, the better. Now, you may be wondering why since some desk space is pretty much all you need, right? You can easily get away with a simple desk or table for your sewing machine and be perfectly fine. The problem with this is when you become more advanced with your sewing. You’re going to need space to store all of your sewing essentials. It’s also much easier to sew when you have plenty of room to lay out your materials and patterns. This is especially true if you’re going to be sewing larger items such as quilts and blankets. 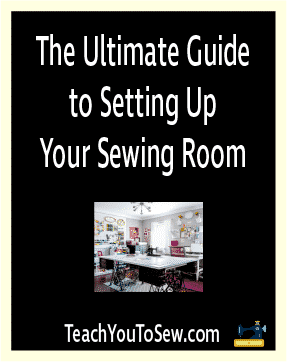 Pick the biggest room for your sewing studio. You’re going to want a nice, clean area when you start setting up your sewing space. Clutter, disorganization, dust, debris, etc are disastrous for any kind of crafting – but especially sewing. Take the time to clean out the area where you’re going to sew. Not only will the reduced clutter make you happy, but you’ll have much fewer mistakes when sewing. Anything that can be cleaned out, should be cleaned out. Now that you have a perfectly clean room and sewing area, it’s time to setup your workstation. Now that you have your sewing workstation setup, it’s time to arrange your sewing space. Let’s start with the most important, and biggest, piece – the sewing machine. You want to place your machine so that you can guide the fabric through with your DOMINANT hand. Remember, sewing is all about precision and control. Set yourself up for success by placing the machine where your dominant hand can have the biggest impact. You want your pedal to be flat on the floor, with a little bit of slack in the cord. If possible, it’s also best to have the cord go around the back of the workstation and come out under the desk. In other words, try and avoid having the pedal cord hanging off the front of the desk. It’s very easy to knock into the cord with your legs or chair. This can cause you to mess up, and potentially damage your sewing machine. The general rule of thumb here is the bigger your sewing machine, the more centered it should be on the desk. I’ve said it before and I’ll say it again – sewing is all about precision and control. By centering your larger sewing machine, you’re providing the machine a larger amount of stability. Smaller machines afford you with more flexibility in the placement of the sewing machine. Either way, I highly recommend that you center the machine on your desk. Now that you’ve setup the biggest component of your sewing essentials, you can setup everything else. Keep your sewing storage within arms reach. If you have a standing sewing storage unit, then keep it to the left or right of your sewing desk. If you have a desk storage unit, then keep it on the OPPOSITE side of your dominant hand. While you’re going to be going into the sewing storage unit a good amount, it’s not so frequent that it needs to take up the premium working space. If your sewing desk has drawers (which it definitely will if you bought one of the sewing desks we recommended), then keep your patterns in one of the drawers. I recommend keeping the patterns in one of the middle to bottom drawers. You’ll take them out when starting a new project, but that’s about it. Keep your sewing thread and needles in the sewing storage unit. These items are so small that they’re very easy to misplace. If you have an abundance of thread, then you can use one of the drawers in your sewing desk. Keep your notions and supplies either in the sewing storage unit or in one of the drawers. It really depends on the size and frequency of use. Stuff like scissors, sheers, pencils, and erasers should be kept in the storage units. Other things can be kept in the drawers. You’ll have to use your judgement on this one. Keep your fabrics stored in the sewing desk drawers. Make sure that the drawers are clean and that the fabrics are neatly placed when the drawers are closed. If you’re dealing with fabrics that are sensitive to light, temperature, and/or humidity, then you should consider getting a protective storage unit for your fabrics. Your sewing studio is going to become your relaxing, happy place. The place in your house where you can escape. With your sewing studio fully setup, you’re now ready to begin sewing.